This was one of the nicest, least stressful holiday season we’ve had in a while. Between Thanksgiving, Christmas, the day after and on into New Year’s eve, everything just fell into place with no last minute surprises – unless you count little Tommy making it home a last minute surprise. We hosted a family Italian dinner on the 26th and that too went like clockwork. I think maybe not having any little kids in the loop made it all more predictable. Then on the 27th, Nancy and Ali came to the lake to spend a few days. The weather was perfect – sunny, low 80’s – for sitting on the dock, drinking a few brewski’s, and solving the world’s problems. We ate mostly from the garden and we’ve crossed over to where guests can now leave here with a bag of veggies to go. They got cherry tomatoes, kale and lettuce plus some citrus. Nancy picked up some fresh pineapples at a grocery store in Crescent City last week. I cut them up, threw the skin in the compost pile and replanted the tops. 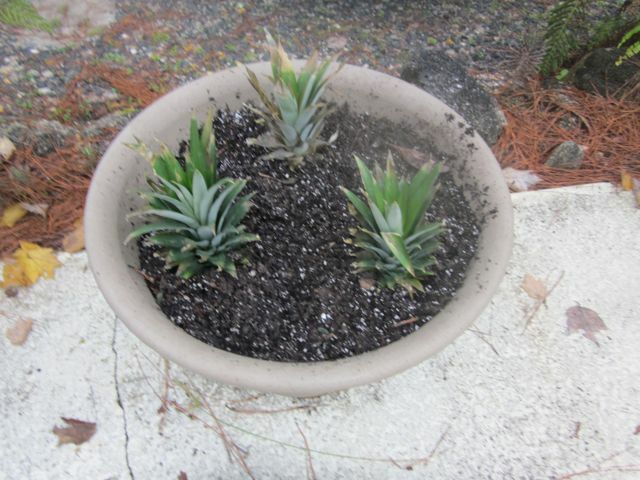 When we lived here in the 60’s we grew several pineapples this way but not sure if it’s too cold here or not. I planted them in a container so I can cover and/or move inside if necessary. Fun experiment and who knows, maybe it’ll work again. A neighbor fishing in a local lake came by with a large bag of speckled perch carcasses to be buried in the garden. They looked like cabbage fertilizer to me so I buried a carcass by each plant, but not too close. I was a bit concerned that something would dig them up but decided to give it a try. Two nights went by with no problems at all but on the third, about half had been dug up. I was very lucky and not one plant was disturbed which makes me think that the culprit was a small cat rather than a raccoon or possum. I reburied them only to have the same thing happen the next night. Plus another raid around the periphery by an armadillo so I had about an hour’s repair to restore both raids. Again, no plants were disturbed. Got enough greens, not counting Kale, to satisfy the green smoothie requirements. Right now that means Swiss Chard, collards, and spinach. Way more than enough kale by itself. Could even mix in a few beet and kohlrabi leaves to spice things up. Radish greens. In fact, we have enough produce coming out of the garden to satisfy the veggie needs 100% and then some. Two inches of rain last night and the garden is a swamp again although everything looks pretty good. The rain on the roof woke me up a couple of times last night but there must have been some wind there too. Another dead bay tree came down. It was on our property but came down onto George’s, across the compost pile, and onto his asphalt driveway. I got it pretty well cleaned up but will have to deal with the main trunk later. That part is in the jungle on our property so no urgency. This has really been a wet fall. One thing that seems to have changed this year is our maple tree dropping it’s leaves. This tree normally drops all it’s leaves in just a few days. They go from green to yellow to gone really fast and that seems to be happened just that way this year. The difference is that it normally happens in February, not December. This fall has been cooler and wetter than normal – more like winter than fall – so maybe it faked out the maple. The leaves from this one tree generates a major load for the compost pile but the compost pile won’t be ready for the input until February. Somehow I’ll deal with it. Had a great Christmas. Joey and Mark came over Christmas eve to help out around the place and stayed overnight. We drove down to Tom’s to celebrate the day with a surprise guest, little Tommy. Tom’s family had driven up to Chicago the week before to attend his company’s Christmas party and little Tom rode back with them. It was a fun day – great company, great food, and a hookup with Joanne’s family, Johnny, Nancy and Ali. We’re hosting a spaghetti dinner today, the 26th, then Nancy and Ali will be coming the 27th and staying a couple days with us. We’re looking forward to it all. We talked to Chris for his birthday and Christmas. He and Jamie had driven to Jamie’s mother in Wisconsin. Apparently the large snow storm forecast never materialized so it was an easy, uneventful drive. Got the dishwasher after a few false starts on the delivery. A robo call told us it was coming Dec 18 between 2 and 4 PM; a human call told us that it was going to happen on the 19th, time to be determined. A couple hours later the robo guy called again to reconfirm his original message. It didn’t happen until 4pm on the 19th. Joey and Mark came up on the 20th and we’re back in the dishwashing business. There was a difference in the connections between the old machine and the new one but two trips to ACE had us up and running. Very quiet so that delayed start feature is probably not necessary but we’ve got it just in case. After the installers left, we washed a load of dishes. All seemed to go well until a couple hours later I stepped in a puddle. It wasn’t obvious where the leak was coming from but based on the amount of water, it wasn’t a major hose break, maybe a drip drip kind of leak; in my mind, the kind that fixes by putting a bowl under the leak or maybe if we used the delayed start, it would dry itself out by the next morning. But the installation surely comes with a warranty. We had breakfast the next morning and loaded the dishwasher for another run. I parked myself horizontally on the floor in front of the dishwasher with the front cover removed and a flashlight so I could find the leaky connection. Never happened. Mark had a theory that perhaps air bubbles were created/trapped in the water lines which would create one time leaks. Right now that looks to be explaining what happened. Planted some more “new” seeds, an escarole/endive mix and a new butter crunch lettuce variety. Not sure what you do with either escarole or endive but I think maybe you mix it into salads raw. I’ll do further research if and when anything grows. This is how I broaden my horizons. Even if we don’t like it, bet it’s good trading material. Maybe the shrimp lady is crazy about escarole. At this point I’m 100% + planted (some things I’ve planted are too close to each other). I’ll be scrambling for space when I thin these new seeds next week. Ditto the carrots I have to thin – where to put the micro carrots? With carrots and radishes I just put them along the outside of a row, making a hedge. I’m eyeing the row of cabbage now trying to decide if there’s enough room to squeeze a carrot hedge the length of the row. The weather is perfect for transplanting – low 70’s, cloudy to drizzly. I’m ok with opening Cuba so long as they don’t become another drain on our tax dollars as their neighbors are. I’m also ok with Sony pulling that NK movie. I can visualize the Sony lawyers going apoplectic at the very thought of an incident at some theatre. Ditto theatre owners. I do hope that the US Gov’t quietly, behind the scenes retaliates in some significant fashion. I’m a morning person. That works much better in the summer because it’s bright daylight when I get up and it’s warm so I can be outside playing before 7AM. It gets too hot to work in the afternoon so I have to go swimming or otherwise play in the lake. Finally it cools down while it’s still light and I can do fun evening things until 8PM. This time of year, can’t even say the “W” word, I get up and it’s still dark and too cold to go out. Sometimes it’s 10AM before I can really get up to speed. Then to make it worse, a few hours after it warms up it’a dark and cold again. Barbara brought over a container, probably a quart or more, of Portuguese Kale soup. I had noticed that a few leaves had disappeared from the Kale plants but with 10 plants, we will have enough to feed half of Barberville. I use one leaf in my green smoothies and have such a variety of green candidates for smoothies, that I can always count on having kale if I want it. The soup was delicious. I looked up Kale on a nutrition guide and compared it with other greens. Hands down, Kale is the clear winner in the vitamin A dept. Way more than spinach or any other green I checked. Doing that check I was surprised to find that cabbage is a killer source of vitamin C. I always think citrus when considering vitamin C but now I’ll never look at cole slaw the same way. Just watched a really strange TV show. It was originally shown on FX a year or so back but we watched it on DVD via Netflix. Fargo is a dark, dark comedy – I guess. Lots of blood and gore; lots of laughs – good writers, good direction, good sound track. Lots of big name actors playing smallish parts. It reminded me of several Tarantino movies so if you like those, you’ll like this. I really have to laugh when I hear Economists trying to sell the idea that falling gas prices are a bad thing; and when they think our inflation isn’t high enough; or that Russia or Iran or Venezuela getting squeezed is a bad thing. These guys have zero credibility with me. The only negative I can think of with low gas prices is that it becomes tempting for the gov to raise gas taxes. December is a bad month for doctors here. Nancy and I have a set of doctors to cover the various disciplines that schedule semi annual visits for routine checkups. Those happen in July and December so by the end of this month, we’ll be pretty well picked and poked. Most of my doctors tell me I’m healthier than they are. Not necessarily the Urologist, Dr.Grinch. Bah, humbug. Joey and Mark came over the other day to help me redo the entry ways into the three sheds. Over the years these pavers have shifted and sunk so that they were barely visible and wobbly. That wasn’t working for Nancy. I had put the pavers in myself years ago but they are heavier than they were when I first did the job. Way heavier. Also one shed had sagged enough that the doors weren’t lining up properly, making it difficult to lock. So I asked them to redo the entry ways and straighten up the shed for my Christmas present. They had it done in a few hours and I have to admit that it’s probably better now than when I did it the first time. We’ve had 6 days in a row that flirted with frost in the morning. It’s not unusual to string a couple of cold days together but it is different to have it last so long. I decided not to cover the garden and it looks like I lucked out and made the right call. The only thing at this point really vulnerable are the tomatoes. If they were forecasting temps in the mid 30’s, I’d cover but the mornings have consistently been just above 40 and even though they say we can still have frost, we don’t seem to be frost prone here until it gets a few degrees colder. I think being so close to the lake makes the difference. If we survive the next 2 nights it looks like a 10 degree warming trend will get us almost until Christmas. For reference, the climate folks say the date for the first frost here averages Dec 20. It also looks like the 14 cabbage transplants made yesterday have all survived. The only thing left to plant are 6 Calabrese broccoli plants that need another week in a sheltered environment – that rounds out and fills the garden for now. The next space will open when the tomatoes crash and no telling when on that. It’s not impossible that they could survive another month. If that happens I probably won’t refill the space with more winter crops but instead get it ready for spring plants in March. Hard to believe but I’ll be starting the warm weather crops, inside, next month. Ordered the new dishwasher and scheduled delivery for December 18. Joey and Mark will come up to do the installation. I’m fairly certain I could do it myself but…………… One feature on the new one that the old one lacked was a “delay” start. That way Nancy can load it after dinner and set the start for 6 hours later. With our small house the dishwasher is too close to the TV so it bothers me when I’m trying to listen to the news over the dishwasher noise. This one is supposed to be quieter but I’ve never really heard a quiet one. I made chicken cacciatore last night, my speciality. I did one modification to my tried and true recipe by adding a handful of fresh spinach leaves for the last two minutes cooking. Great change!! Don’t think I’ll risk it with one of the new exotic greens unless they are so spectacular, I can’t resist. Anyone who has had long term weight problems has a range of sizes hanging in the closet. When you’re on the growth side, you don’t want to ditch stuff you’ve outgrown since you know you are going to lose the weight; when you are losing weight, you know it won’t last so you keep the larger sizes. About 20 years ago, I needed a heavy pair of dress slacks to wear in the winter. I bought a really nice pair at what I thought was the right size from LL Bean and was disappointed when they were way too tight. No problem, I was going to lose some weight and they would be just fine. I did lose some weight but they were still too tight and they became my designated trial pants – any time I thought I had slimmed down enough I’d try them, I’d run a test. Never happened. Fast forward to now and I needed some heavy dress pants to get me through the cold spell we’re having. I was looking through the closet and happened upon my old LL Bean test pants. My current situation is that most of my clothes are on the big side with Nancy taking them in from time to time. I can comfortably wear 36’s and have trouble keeping 38’s from sliding down to my knees. I looked at the label on the test pants and saw they were 40’s but decided to try them on to savor the victory. They fit nicely – just like 36’s. So all those years I was trying on mislabeled slacks. Nancy decided to bite the bullet and get a new dishwasher. Wimp. Mark said it was just a matter of removing a couple of easy to get at screws pulling it out from under the cabinet and then disconnecting the water line and electrical. We found one that would do the job in Lowes and it was coming down to coordinating getting the new one delivered and the old one carted away and having Mark on hand to do the installation. I decided it would make the logistics easier if I could do the de-install myself. I got the cabinet screws out easily, just as forecast but could only slide it out about halfway before meeting resistance. Rather than brute force it, I called George who was on my doorstep about 2 minutes later to help me over the rough spot – that meant jumping in and doing the job. We/he had it out in about 15 minutes and he took the carcass to strip down for parts and sell off the scrap metal. One of Joey’s friends came up with a 10% coupon so it seems this is being pulled off with a minimum hassle. Lib’s please read no further. For the past 6 years I’ve looked hard to find the silver lining to the dark cloud this administration has brought on the country. And I think I found it. When we hired this administration we knew were were getting a Harvard law professor/Chicago community organizer. He was eloquent, had a great looking family, and perhaps he’d hire a staff that could handle all the technical stuff and the business of running the country. The economy got worse but he could blame that on the previous administration; foreign policy got worse but he could blame that on the previous administration; most people were quite satisfied with their health care but that’s no longer the case. Gas prices dropped dramatically which should jump start the economy but they really can’t take any credit for that since they fought it tooth and nail by blocking every pipeline and drilling project they could. Just don’t understand the relationship between energy and the economy I guess. I had consoled myself that the one good thing that would come out of this admin is that race relations would improve. Wrong again. The most current polling shows that both races believe race relations have worsened dramatically in the past 6 years. Back to the 60’s. Reverend Al is picking up right where Reverend MLK left off. So where’s the silver lining? The South is once again solid red, conservative Republican and the midwest is going that way. You know things are on the right track when Wisconsin is electing Republicans again. The Socialist segment of the Democrats are in strong ascendency, owning the Northeast and West coast, so we’ll have clearer choices – this soft middle ground is disappearing. And who ever thought you’d hear Chuck Shumer say anything that made sense? This new internet provider is working out quite well. We’ve been operating on it for over two weeks now with only a few glitches and it’s lightning fast, actually faster than the wifi at the library or Big Rig or Florida Hospital – my alternative wifi locations. The T-Mobile network we had been using was cheaper but the performance was really marginal and you had to have lots of patience to deal with it. Then T-Mobile essentially doubled the price so we started exploring other options. Tom came up with an alternative that used the ATT network, which we knew presented a good, strong 4G signal at the lake. With just a small $$ increase from the original T Mobile Walmart deal, the performance jumped light years. As the crow flies we’re probably less than a 1/2 mile from the tower so the signal is super strong, 5 bars most of the time. Nancy got a giant bonus with the new network – she can now watch video quilting tutorials from her favorite site – Missouri Star Quilting, or something like that. The T-Mobile network was just too slow to watch anything dynamic so she’s a happy camper. We’re having Seattle September kind of weather – overcast, cool, damp. Perfect weather for young cabbage transplants – not for the transplanter. Typically I lose a couple of transplants due to heat/sun stress or maybe grasshopper predation but these are making the transition in great conditions. I plant a couple then run inside and warm my bones – it is 60 you know. A total of 15 plants, 2 varieties, one complete row will be done by this evening. Cole Slaw in February. My definition of a winter day is any day that doesn’t reach 70 and we’re having a couple winter days this week. I need to figure a way to jump start this global warming thing. Maybe if I burn a few bushels of coal in the back yard that could help. I need to find the really nasty, smoky, kind of coal. I might even tough it out and put in another row of radishes. Those seem to be a best seller this year. The first patch I put in is just about gone and scheduled to become a spinach patch in a couple of weeks. A difference in crop consumption this year has to do with George’s recent heart issues. I think he got a strong message from the doctors that he has to lose some weight and I’ve noticed a dramatic increase in the salad makin’s being picked. There’s a bit of a conflict in the messaging because he’s not supposed to eat greens – somehow they’re not good for you if you have heart issues so he has to lose weight but can’t include green vegetables in his diet. We’re debating how red lettuce counts. Do you count them the same if you eat them raw? and dip them in Ranch Dressing?